LOOKING GLASS publishes in paperback in 2019, but is now serialising on the wattpad platform. When a young girl disappears from her Oxfordshire mansion, a lonesome, opium-addicted academic descends into the underworld of Victorian England to find her, uncovering a ghastly conspiracy that leads to the throne. This is the possible origin story of ALICE IN WONDERLAND. 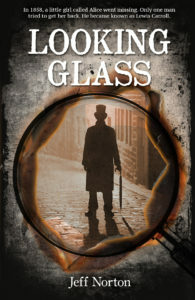 LOOKING GLASS is a visceral thriller, about addiction and revenge, set in the underworld of Victorian London. Keep up to date with LOOKING GLASS on wattpad.